The Indian Equity Markets had a short week as the Markets remained closed on Friday on account of Holi. This week as well, just like two previous weeks, the benchmark NIFTY Index ended on a flat note heading nowhere. 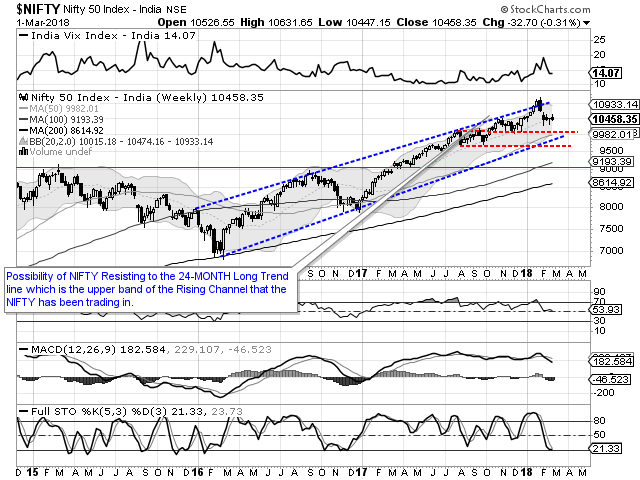 The NIFTY saw itself ending the previous week with loss of 32.70 points or 0.31% on weekly basis. If we analyze previous five weeks, the NIFTY ended the first two weeks with loss off 3% each week. Then the remaining three weeks saw NIFTY closing on a flat note. As we approach the new week on Monday, it is very much likely that we will see a rough start to the week. The global markets have remained week post Indian Markets closed on Thursday. We are likely to see a weak opening to the trade and there are all chances that we see NIFTY testing its immediate support zone of 10310-10275 on Monday. However, it would be extremely crucial to see how the Indian Markets react to these levels. There are high chances that we see some resilience stepping in if NIFTY tests these levels. The coming week will see the levels of 10510 and 675 as immediate resistance zone for the Week. Supports come in at 10310 and 10250 levels. The Relative Strength Index – RSI on the Weekly Chart is 53.9312 and it has marked a fresh 14-period low which is bearish. 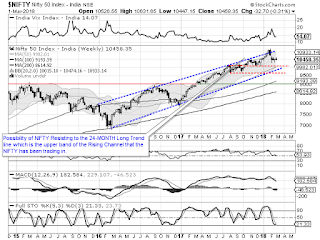 A Bearish Divergence is also seen as the Weekly RSI has marked a fresh 14-period low while the NIFTY has not done so. Weekly MACD stays bearish while trading below its signal line. No significant formations are observed on Candles. If we have a look at pattern analysis, we see that NIFTY is currently resting at its 20-Period moving average. If we see a negative start to the trade and the likelihood of which is much higher, NIFTY will see a breach of this support area if the week is ended on a negative note. Overall, the coming week is likely to remain volatile and bit stormy as well. While we cope with the global weakness there will be two situations that we will be dealing with. First, the very likely possible weak start to the trading week and the volatility that will come with it; and second, the behavior of the Markets vis-à-vis the 10-310-10275 support zones. There are high probabilities that we see Markets behaving in a resilient manner if these supports are tested. We advise Market participants to approach this week on a highly cautious note and avoid any significant exposures. NIFTY has added large number of shorts over past couple of days and this may act as support in event of weakness, if any. We recommend approaching this coming week on a cautious note and remaining light on overall exposures. 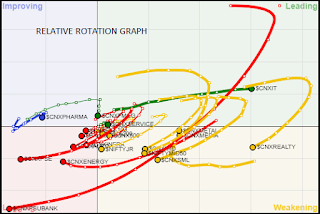 A study of Relative Rotation Graphs – RRG this week paints a little tricky picture. IT pack which has remained in leading Quadrant is likely to evidently outperform the general Markets on relative basis. The PHARMA, IT and SERVICES stock are seen losing momentum though may lend support on selective basis. METALS also is likely to see select outperformance but his would remain on highly selective basis as it has faltered on relative Momentum in the week that has gone by. But it is still likely to fare relatively better than other sectors. All other sectors like Auto, BankNifty, Media, NIFTY Next Fifty and other broader Indices are steadily losing on both relative ratio and momentum and are not likely to put up any significant performance. Key performers are likely from IT, and select Metal, Pharma and Services sector stocks.